Marvel did a lot of things right in their approach to the first Avengers movie. But one thing they absolutely nailed, time after time, was the use of after-credits shorts to build excitement for the next episode. Whether it was Thor’s hammer, Nick Fury talking Avengers Initiative, or Loki & the cosmic cube, Marvel struck an impressive balance between fanboy nerd revelations and mass consumer curiosity. The Avengers was no different in its after-credits buzz-building. If you saw the film any time in the first month of its release, there’s a strong chance you heard comic guys & gals in the audience inhale with the sort of excited shock generally reserved for marvels of God. Things like walking over the Grand Canyon. Watching a dolphin leap out of Hawaii’s icy blue coast. Discovering another human is willing to get naked with you. It was an appropriate reaction, then, for as we’ll see, this after-credits revelation is truly a Marvel God: Thanos, the mad Titan (in all his high-res glory below). This is the first time Marvel Studios has used the credits for a major character reveal, and while Thanos is easily one of the coolest characters in the Marvel cosmic canon, he’s not exactly a household name. It’s understandable if you were one of the ones in the audience going “Wha? Huh? !” as I high-fived my wife’s shoulder excitedly (she stopped offering a hand after about the 12th time). Who is Thanos? In short, he’s one of the single most powerful, diabolical, brilliant and riveting villains in the Marvel canon. He’s like the Dr. Doom of space, but probably even smarter, and with better gloves. So without further ado, if you’re looking to stride into Avengers: Infinity War with the confidence of this guy, or if you’re looking to enjoy the schemes of the Titan with the Purple Scowl in full, here’s the complete Thanos reading order guide. You can click each link below for full reading information. Enjoy! The above omnibus edition is released in conjunction with Avengers: Endgame and includes the next four Thanos stories on the list (Thanos’ first appearance through The Death of Captain Marvel (does not include Spidey Super Stories!)). A lot of readers have asked me “Hey, what about the Avengers vs. Thanos trade? Where does that fit?” It’s a good question, and essentially, Avengers vs. Thanos will give you a combined package of 1) Thanos First Appearance + Captain Marvel & the Cosmic Cube & 2) The Adam Warlock adventures. It also adds a few oddball Daredevil issues that technically involve Thanos. If you’re a purist, you’ll miss out on a few Warlock issues (#12 to #14), but all in all it’s a good trade that gets you the best of early Thanos stories! This out of continuity comic for kids has gone down in history as one of the more hilarious Thanos stories possible. Witness the birth of the Thanos Copter!!! Marvel’s first official Original Graphic Novel is – as you’d expect – a Jim Starlin Captain Marvel story through and through. Aside from simply being a classic and all-time great, though, Starlin does weave some Thanos throughout, and the graphic novel can fit within the larger Thanos narrative. Note that the above link will provide a full event reading order for the early 90’s Infinity Gauntlet. The comics included are based on the Infinity Gauntlet Omnibus , although I have reordered significantly as the omnibus is a chronological mess. While I enjoy the Silver Surfer and Dr. Strange tie-ins, the core series is accessible on its own, and you can enjoy Infinity Gauntlet here! It’s at this point that I’d also recommend Comic Book Herald’s complete Infinity Saga reading order, which will give you all the tie-ins from Infinity Gauntlet through Infinity Crusade in the most detailed list. You could also pick up the Infinity Watch Vol. 1 here, which collects Warlock & the Infinity Watch #1 to #22. Only read Infinity Watch #1 to #7 prior to Infinity War, issues #8 to #10 are tie-ins, and #11 to #17 are included in the Infinity War: Aftermath. The Warlock and the Infinity Watch tie-ins are the most highly recommended Infinity War tie-ins. Again, for the whole reading order details, check out the Infinity Saga guide. Includes Secret Defenders #12 to #14, and Cosmic Powers #1 to #6. 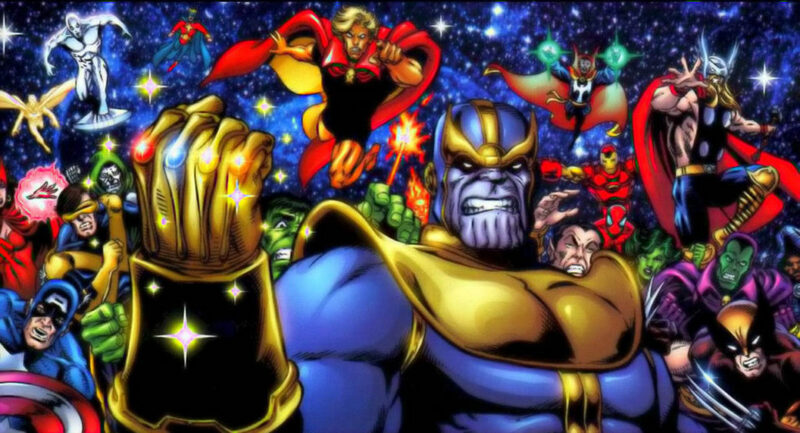 I’d consider jumping to my modern Marvel cosmic reading order at this point through Thanos Imperative. That will fill in the entirety of the Marvel Cosmic landscape around Thanos. Naturally, the mad Titan is a major player in all the events leading up to The Thanos Imperative. It’s worth noting here that Annihilation sparks modern Marvel Cosmic, and although these books are inherently indebted to the one and only Jim Starlin, he’s not involved directly in the saga. Nonetheless, the full Thanos narrative would not be complete without Annihilation through Thanos Imperative. You can view the full reading order here. Seriously, this will be a much better read if you’ve been keeping up with Nova and Guardians of the Galaxy since Annihilation! If you’ve been following me on Comic Book Herald for any amount of time, you know that I can’t stands Thanos Rising. Nonetheless, it’s an in-continuity part of the Thanos narrative. The book deals with the origins of Thanos, meaning in theory, you could place it first on any reading order. Personally I think that’d be a horrible mistake, as there’s no way this should define the character of Thanos. The four issue miniseries starring Deadpool and Thanos references a shared history between the characters in the introduction. This reference is to Deadpool #64 (series starting in 1997) when Thanos appears for a hot 20 seconds to “curse” Deadpool with eternal life. That’s all you need to know, and unless you’re doing a ’97 Deadpool binge (not a bad idea), the issue is unnecessary for a Thanos binge. Pay close attention to the New Avengers #8 tie-in! For the full reading order (which includes crossover with Avengers and Avengers World), you’ll want to check out the Secret Wars reading order. The “Warzones!” Infinity Gauntlet tie-in to Secret Wars is a fantastic miniseries from Gerry Duggan and Dustin Weaver. Obviously an out of standard continuity Thanos appearance, but an excellent read for fans. “Death Sentence” is a prose novel by Stuart Moore and does not need to be included as part of any standard Thanos continuity. In fact, the novel falls in a nebulous modernized Infinity Gauntlet timeline, effectively beginning at the conclusion of Infinity Gauntlet but including the modern Guardians of the Galaxy and others. It’s an interesting read for Thanos-heads, and at its best reminds me of George R.R. Martin’s excellent Tuf Voyaging . Although Ultimates Vol. 1 does not directly relate to Thanos, you’re going to enjoy this second volume a whole lot more if you’ve read the first six issues of Ewing and Rocafort’s Ultimates. It’s also one of my favorite All-New All-Different Marvel series. Note also that Unworthy Thor is very much a Thor story that happens to feature Thanos, rather than the other way around. Familiarity with Jason Aaron’s extended run on Thor will go a long way to understanding the story. Speaking of Jason Aaron’s time writing Thor, issues #3 and #4 of Thor (2018) feature Thanos cameos following up from his role in The Unworthy Thor.